So what’s on your literary travel bucket list? What literary hot spots have you already hit and is it worth going back? I have a couple of literary bucket lists, mainly because I love my adopted home of New England, which is the cradle of American literature, and also because I am an Anglophile who lives British literature and is desperate to visit the UK, where there are many places on my bucket list. Walden Pond in Concord, MA. I have been there before in the dead of winter in February. The pond was frozen over. 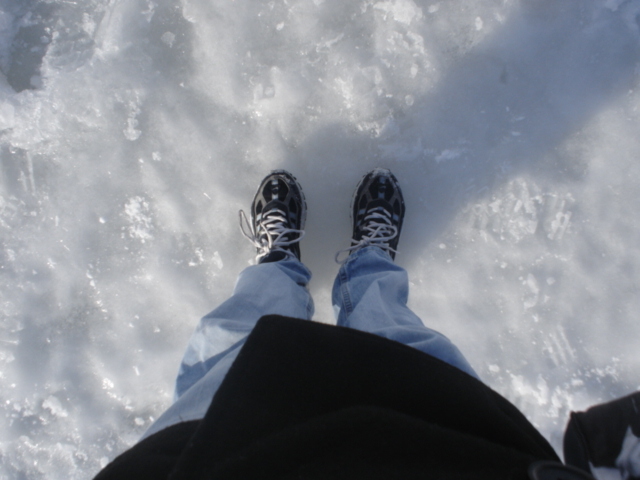 I took this obligatory picture of my feet standing on the frozen pond. I want to go back some time this summer. I don’t live far, and it’s sad that I haven’t had a chance to go because of an unreliable vehicle, but I have a new car now, and we are road tripping the hell out of this summer. I can’t wait to go to Walden. Emily Dickinson’s house in Amherst, MA. The Dickinson home is now a museum, and I have already visited, but I want to go back during some special occasion or event. I just became a member of the museum, so it will even be free. Oh, I was just so happy here. I visited Emily’s grave. If there is one poet I really love, it’s her. Obviously I named my blog after one of my favorite of her poems. The Mark Twain House and Museum in Hartford, CT. I haven’t ever been here, but Hartford is not very far from where I live, and Twain is a favorite of mine. Twain wrote The Adventures of Huckleberry Finn while living here. I teach that novel and absolutely love it (until the end, which Tom Sawyer ruins). Sleepy Hollow Cemetery in Concord, MA. I want to pay my respects to the authors buried there, including Nathaniel Hawthorne, Ralph Waldo Emerson, and Henry David Thoreau. There is something kind of special about visiting the grave of an author you love. Ralph Waldo Emerson’s house in Concord, MA. He wrote most of his work here and hosted meetings of the Transcendental Club here as well. I think it’s open to the public. Robert Frost’s Stone House in Shaftsbury, VT. I wrote a research paper on Frost in high school, and that kind of thing makes you feel ownership over a writer. “Stopping by Woods on a Snowy Evening” was written here. Boston by Foot has an interesting-looking tour of the literary haunts of writers like Emerson, Hawthorne, Thoreau, Alcott, James, Dickens, and Longfellow. I want to try that tour for sure. The Brontë Parsonage and Museum in Haworth, West Yorkshire. Must see. I want especially to explore anything that may have influenced Wuthering Heights. I think some of the sites are scattered a bit, so it might be more accurate to say I want to visit Brontë Country. Jane Austen’s House and Museum in Chawton, Hampshire. I don’t want to miss a chance to see where Dear Aunt Jane lived and wrote. I don’t think they let you touch anything. It’s probably like Emily Dickinson’s house that way. I would so want to touch her stuff, though. Shakespeare’s hometown of Stratford-upon-Avon, with trips to his birthplace, New Place, the church where he is buried, and perhaps a play at the Royal Shakespeare Theatre. The whole town, really. I mean there is Anne Hathaway’s cottage, and the home where Shakespeare’s mother lived, too. Bath, Somerset. Austen wrote about this town and lived there for a time. Many films set in the Georgian era are filmed here because it still looks Georgian. Of course, Austen set Northanger Abbey and Persuasion here as well. The Charles Dickens Museum in London. Dickens wrote Oliver Twist while living here. Tintern Abbey in Monmouthshire, Wales. William Wordsworth wrote “A Few Lines Composed Above Tintern Abbey” here, and I feel pretty positive pictures don’t do it justice. The Lake District. Wordsworth and Samuel Taylor Coleridge both called it home, and there are places all over that I want to see, including Wordsworth’s Dove Cottage in Grasmere. The New Shakespeare Globe Theatre in London. A reconstruction of the original Globe. I must see a Shakespeare play here. The British Library in London. I don’t really even know where I’d start here, but I want to go. The Sherlock Holmes Museum, London. Not exactly located at 221b Baker Street, but close. I do love Sherlock Holmes. John Keats’s home near Hampstead Heath in London. Because Keats. Poets’ Corner in Westminster Abbey in London. I want to pay my respects to Geoffrey Chaucer, Charles Dickens, Thomas Hardy, Edmund Spenser, and Alfred, Lord Tennyson. Among others. Platform 9¾ at King’s Cross Station in London. Because Harry Potter. The Fitzroy Tavern in London. I heard that Dylan Thomas would give out poems written on beer mats to any woman who asked while he was drinking here. A girl can dream. Bloomsbury in London. I want to walk in the footsteps of Virginia Woolf and E. M. Forster. Yeats lived nearby. I really just want to sit on a bench, maybe the same bench Virginia Woolf once sat on, and think. Newstead Abbey, Nottinghamshire. Byron lived here. His beloved dog Boatswain is buried here. Byron was buried nearby. Field Place in Broadbridge Heath, West Sussex. The poet Percy Bysshe Shelley was born here. I’m not sure it’s open to the public, but I could at least look at the exterior. I’m sure if I thought about it, I could come up with quite a few more places to visit. 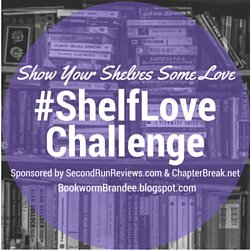 I haven’t made any progress on the #ShelfLove Challenge since last month because I’m in a reading slump. Just not really excited right now. I am sort of waiting for school to wrap up so I can spend more time reading. I have a bunch of books I “need to read” right now, too, for various reasons, and I am not excited about it. I don’t know why it is that when I “need” to read it, even if I wanted to read it before, I can’t get into it as much. Dana: when in the Lake Ditrict, don’t miss the Beatrix Potter home. We went there simply because the weather was horrible and we wanted somewhere dry, but found it fascinating. I should add it to the list then. I hadn’t considered it, not really having been a fan, but if you say it’s fascinating, then it’s on my list. Great list of New England sites. I want to go to many of those, maybe on a future New England Book Blogger meetup. Let me know if you’re interested in hearing about our next one! There is also the Robert Frost Farm in Derry, NH. It’s not far from where I live so I hope to get there this summer. In the UK, I have been to the Globe and the Bronte Parsonage, both well worth the visit. I also really want to go to Bath and the Lake District…I was planning to on my last trip but it didn’t work out. So many places to visit – it’s fun to dream! It sure is. I would be interested in hearing about a meetup in New England. I originally was going to put Frost’s farm on the list, but I didn’t. I’m sure there are other places I haven’t remembered. You honestly must see a Shakespeare play at the new Globe. It’s one of my favorite memories from my visits to London, seeing plays there. I saw Mark Rylance in a production of The Tempest in 2005 (I think?) that was one of the best Shakespeare plays I’ve ever, ever seen. My memories of Stratford are — less rosy, I have to admit. We saw two plays, neither of which was very good, and all the dudes in Stratford were sketchy as hell. So. Much. Catcalling. With, like, gross and explicit gestures.